Looking to BOOST your Real Estate Career? Do you want MORE listings and clients? Do you want to be the agent that clients WANT to refer? We know you’ve heard all the pitches on why “Brokerage XYZ” is the best! But here’s the truth. It’s not really about you…or us. We know that sounds a little different, but we believe the success of any agent or brokerage is dependent on the satisfaction of the client! 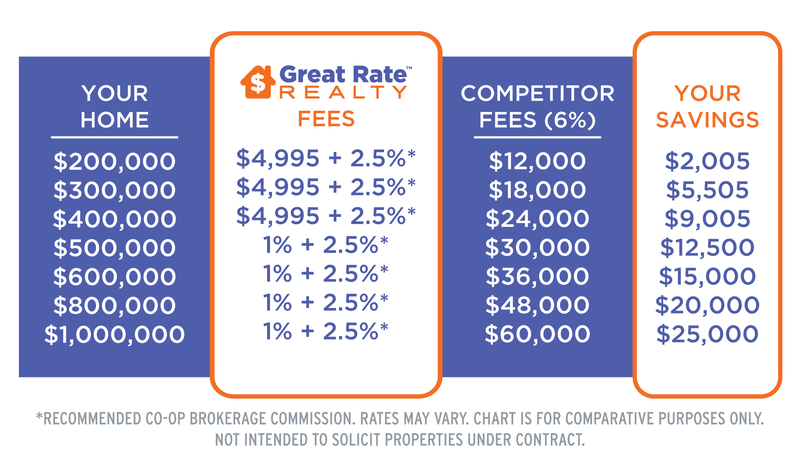 Great Rate Realty offers our clients Full Service Agents at a Fair Price! Our Agents only charge $4,995 for the listing side of any home under $500k. For homes $500k and up, we only charge 1% of the selling price…Seriously! We also consult with the client on the amount of commission they should offer the co-op brokerage and discuss the most popular rates in the area. Bottom line, We help clients save money! Those clients turn in to BUYERS! And our clients are fiercely loyal with referrals! After all, who doesn’t love to save money?! It’s truly WIN-WIN! Our tools can help you win more listings and do more volume, so you can earn the kind of money you deserve! Check out our client savings chart below! It’s also the back of our business cards! We offer agents 100% of their commission with only a fixed price transaction fee on each deal. We recognize that if we are charging the client a low fee to list, we should also reciprocate that approach to our agents. Our philosophy from the top down is that money should only be made when a property actually sells! Your success is our success! So, if you’re an agent that understands that people like saving money, and you want to be able to advertise a lead offer with a brand that can literally start a conversation about saving money just by handing out a business card, call or text our local Great Rate Realty Designated Broker, Michael Wallen, on his cell at 602-570-6164. He’ll tell you about our System of Savings that will benefit your clients, and in turn, benefit you and your career. You can also send an email to mwallen@greatraterealty.com and request our agent opportunity presentation. If you are a current licensed broker or associate broker and agree with our business philosophy, we want to talk to you! We are always looking to partner with brokers who want to be at the forefront of the real estate industry, and who want to help clients save money on their real estate transactions! Send an email to inquiry@greatraterealty.com to set up a call with our CEO. Opportunities nationwide! GRRG,LLC dba Great Rate Realty is used under license from Great Rate Realty Inc.(A Delaware Company) and is an equal opportunity employer that abides by the principles in the Fair Housing Act. Great Rate Realty supports Equal Housing Opportunity. All Brokers/Agents are licensed Realtors® with their local real estate board and are members of the National Association of Realtors®(NAR). Each office independently owned and operated.